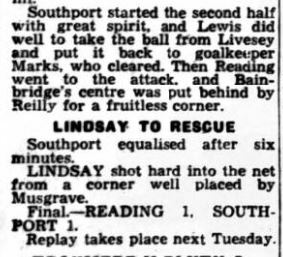 On This day in 1951 Southport played what would turn out to be the first of three encounters with Reading in the second round of the FA Cup. With the game drawn, a replay was scheduled for the following Tuesday at Haig Avenue. With the results still all square at the end of a replay, including extra time, a second replay was scheduled to be played at a neutral venue, Villa Park – the home of Aston Villa, on 1st January.